WebGIS solution for the management and consultation of large raster and vector datasets, ideal to distribute on-line catalogs of cartographic data. A simple tool designed to create and manage geoportals in compliance with the INSPIRE directive. Cart@net helps to create and customize Geoportals, to keep content up to date and to simplify the communication with users and stakeholders. It provides a powerful workflow to support the content management, and all contents can be geo-located. The layout is consistent with the Web portal that hosts the Geoportal: it ensures both the continuity in the aesthetic appearance and the full functionalities of the service offered. Cart@net exposes the services foreseen by INSPIRE (Discovery, View, Download and Transformation Services). Users can easily access the Geoportal content and interact with an organization through the Forum, the News area, the multimedia Calendar and the integration with social networks like Facebook and Twitter. All spatial data are accompanied by their own license thanks to the content management interface of the Geoportal that helps, while publishing the data, to choose and easily produce the appropriate license to be associated with each dataset. Download the brochure with an overview on its versions, features and characteristics. The SINAnet Multiserver WebGIS The WebGIS application for the italian EPA (Environmental Protection Agency) that allows to browse data from different agencies and different servers in Italy, based on both different IMS technologies(ESRI, Intergraph, UNM Mapserver) and exchange protocols. Regione Lombardia (AWARDED at ASITA 2009) The geoportal with all the cartography from the Geographic Information System of the Lombardia Region, where Milan is located, had its first online publishing activities with Cart@net. The Tourist WebPortal of Regione Puglia: (BIT2009 AWARD: Best Italian Tourist Portal) the official and most comprehensive tourist guide of Apulia. 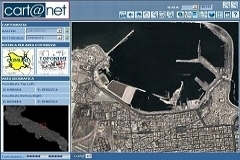 The cartographic navigation section has been developed by Planetek Italia. A number of useful tools are available such as the routing tool, the POI download for TOMTOM and other navigation systems, bookmarks, a geoblog, a 3D view, and more. Atlante Italiano: maybe the first and most comprehensive Italian Geoportal, owned by the Italian Ministry of the Environment, was developed at early year 2000 with Cart@net. It published the cartography of the whole italian territory on the Web Color airphotos of Italy and geocoded maps of the Reference Geographic System.